"I have been remorseful of my actions. And I've tried to learn from them. And run from them. Now I’m aware of the extent of the impact of my actions." The cancellation of Louis C.K’s film “I Love You, Daddy” comes after The New York Times reported that five women accused the comedian of sexual misconduct. Comedian Louis C.K. said Friday that stories in a New York Times report detailing sexual misconduct by the comedian "are true" and that he feels "remorseful" over his actions. C.K. 's first comments since the Times reported that he had masturbated in front of five female comedians and actresses used sometimes explicit language to say that he has come to learn what he did was not okay. "These stories are true," he said. "At the time, I said to myself that what I did was okay because I never showed a woman my d--- without asking first, which is also true. But what I learned later in life, too late, is that when you have power over another person, asking them to look at your d--- isn’t a question. It’s a predicament for them." Five women told the The New York Times that Louis C.K. masturbated in front of them, triggering backlash against the comedian. Netflix has cancelled a planned special episode and the premiere of Louis C.K. 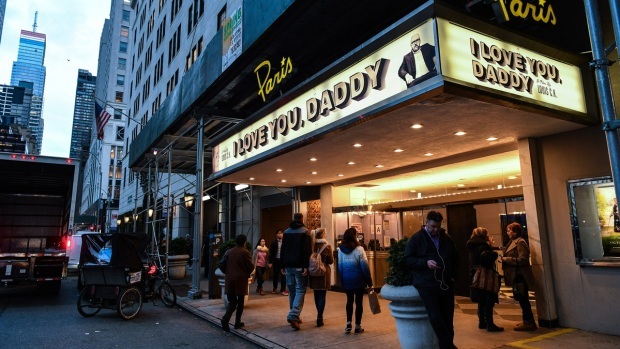 's upcoming movie "I Love You, Daddy' has also been nixed. Kris Sanchez reports. He acknowledged that he held power over the women because they admired him, "and I wielded that power irresponsibly." "I have been remorseful of my actions," C.K. continued. "And I've tried to learn from them. And run from them. Now I’m aware of the extent of the impact of my actions. I learned yesterday the extent to which I left these women who admired me feeling badly about themselves and cautious around other men who would never have put them in that position." He said that he did not forgive himself but did not directly apologize to the women he harmed or ask their forgiveness. The comments came hours after Indie distributor The Orchards said that C.K. 's film "I Love You, Daddy" will not be released. The comedian faced fallout associated with other projects. The film was set for limited release in New York and Los Angeles on Friday and for wide release on Nov. 17. The film's New York premiere was also canceled on Thursday. C.K. has already been edited out of an upcoming HBO benefit, "Night of Too Many Stars," and his work is being scrubbed from the cable network's vaults. More fallout came Friday when Netflix said it will not produce a second planned standup special starring the comedian, citing his "unprofessional and inappropriate behavior." He had been tapped for two specials, with the first airing in April. At least five of the comedian's stand-up specials remain on Netflix. C.K. said that he took advantage of being "widely admired" in the comedy world and also hurt those he'd worked with on projects, his family, friends, his children and their mother. "There is nothing about this that I forgive myself for," C.K. said. "And I have to reconcile it with who I am. Which is nothing compared to the task I left them with." He ended his statement by saying that he had "spent my long and lucky career talking and saying anything I want. I will now step back and take a long time to listen." In a further blow, FX Networks and FX Productions said they are ending their association with C.K., which means cancellation of a deal with his production company, Pig Newton, and removing him as executive producer on the four shows FX is making with him, including "Better Things," ''Baskets," ''One Mississippi" and "The Cops." His compensation is ended as well, FX said. C.K. behaved professionally on all his series for FX, "as far as we know," according to a statement Friday. "However, now is not the time for him to make television shows," FX said. "Now is the time for him to honestly address the women who have come forth to speak about their painful experiences, a process which he began today with his public statement." Actress and writer Pamela Adlon, whose work with C.K. includes TV's "Better Things," said Friday that she and her family "are devastated and in shock after the admission of abhorrent behavior by my friend and partner." "I feel deep sorrow and empathy for the women who have come forward," she wrote, asking for privacy to process the situation before she could say more. Adlon, who stars in "Better Things," also appeared on his comedy "Louie" and is in "I Love You, Daddy." He lost another film Friday, when Universal Pictures and Illumination Entertainment said they have "terminated their relationship" with C.K. on the planned animated comedy "The Secret Life of Pets 2." C.K. provided the voice of Max the dog in "The Secret Life of Pets," which was released last year. The comedian's publicist, Lewis Kay, also announced Friday on Twitter that "As of today, I no longer represent Louis C.K."